Have you watched “Whose Line is It Anyway?” and marvelled at how the actors can come up with brilliant ideas on the spot? 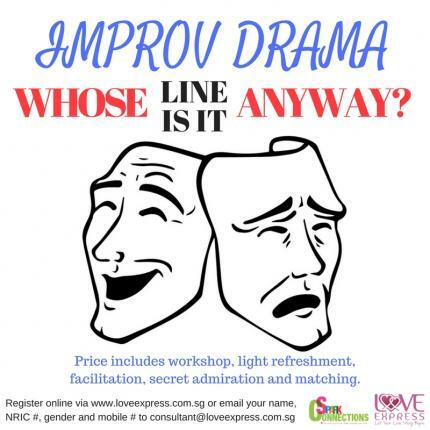 Join us at this one-of-its-kind dating event to spark your creativity and imagination. Try your hand at some basic improvisation and meet new people who are interested to do the same. You can expect to have lots of fun and laughter as we run through simple exercises, and show you how key techniques like deep listening and spontaneity can be applied to spice up your love life! Everyone is welcome.